The global animal health care sector continues to expand at a rapid pace. In developed countries, the sector is driven by improved diagnostic and medical capabilities for companion animals. Technologically advanced diagnostic assays and techniques (such as RTPCR) are experiencing more demand than the conventional diagnosis products. Increased longevity of pet animals led by improvement in diagnostics, greater focus on wellness and prevention by veterinarians, and enhanced nutrition have expanded the scope for use of veterinary diagnostic services and medications. The number of pet ownerships in developed as well as emerging markets is increasing. As a result, expenditure on companion animals is rising globally. Economic growth in developing regions such as Asia Pacific and Latin America is poised to provide immense opportunities to the veterinary molecular diagnostics market during the forecast period. Opportunities offered by these regions are attributable to several factors such as rise in the disposable income of urban middle-class people in these regions. This boosts the per-capita meat consumption, thereby driving the demand for more efficient livestock production. Moreover, increase in awareness about the importance of healthy livestock is expected to propel the veterinary molecular diagnostics market in developing countries during the forecast period. Increase in the number of companion animal owners is a significant trend in the animal health care sector. In 2013, 62% of the U.S. households owned a companion animal (excluding horses) i.e. around 72.9 million homes. Rise in the expenditure on diagnostics, therapeutics, feed additives, and other supplies for companion animals; increase in the number of pet owners and growing urbanization are likely to provide significant opportunities to the veterinary molecular diagnostics market in developing countries during the forecast period. Sophisticated molecular diagnostic instruments and assays are well-recognized and validated for proper testing. However, high costs associated with these systems and assays and lack of skilled technicians pose a significant restraint for the market. Based on product, the global veterinary molecular diagnostics market has been segmented into instruments & software, kits & reagents, and services. In terms of technology, the market has been divided into polymerase chain reaction (PCR), microarrays, and DNA sequencing. Based on animal type, the market has been segmented into companion animals and livestock animals. Based on disease indication, the market has been classified into vector-borne diseases, respiratory pathogens detection, diarrhea pathogens detection, and others. Based on end-user, the market has been segregated into hospitals/clinics and reference laboratories. The reference laboratories segment is expected to remain dominant throughout the forecast period. Geographically, the global veterinary molecular diagnostics market has been segmented into five regions: North America, Europe, Asia Pacific, Latin America, and Middle East & Africa. North America dominated the global veterinary molecular diagnostics market in 2016 and is projected to continue its dominance throughout the forecast period. Growth of the market in North America is primarily attributable to the increase in government and private funding and large volumes of tests performed in the region. North America is also home to several key players such as Idexx, VCA, and Thermo Fisher, which further boosts the market in the region. Europe held the second-largest market share in 2016. The market in the region is projected to expand at a significant CAGR from 2017 to 2025. High adoption and usage of superior-quality diagnostics and treatments in the region is one of the major factors driving the veterinary molecular diagnostics market in Europe. This can be attributed to increase in the number of diagnostic laboratories, government funding for veterinary health care activities, and rise in awareness about veterinary molecular diagnostics in the region. Asia Pacific is a rapidly expanding market across the world. High adoption of veterinary diagnostics, drugs, vaccines, and medicated feed additives for the well-being of rapidly increasing population of livestock animals in the region makes Asia Pacific one of the most lucrative markets for veterinary molecular diagnostics. Key companies profiled in the report include IDEXX Laboratories, Inc., VCA, Inc., Thermo Fisher Scientific, Inc., Novacyt Group, QIAGEN N.V., Biomedica Medizinprodukte GmbH & Co KG, HealthGene Corporation, and Bioneer. These players are adopting organic and inorganic growth strategies to expand their product offerings; enhance their geographical reach; widen their customer base; and gain market share. For example, in March 2015, VCA acquired the molecular diagnostics division of Abaxis Veterinary Reference Laboratory (AVRL). This report on the global veterinary molecular diagnostics market analyzes the current and future prospects of the market. The report comprises a comprehensive executive summary, including a market snapshot that provides overall information of various segments and sub-segments. The research is a combination of primary and secondary research. Primary research represents a bulk of TMR’s research efforts along with the information collected from telephonic interviews and interactions via e-mails. Secondary research involves study of company websites, annual reports, press releases, stock analysis presentations, and various international and national databases. The report provides market size in terms of US$ Mn for each segment for the period from 2015 to 2025, considering the macro and micro environmental factors. 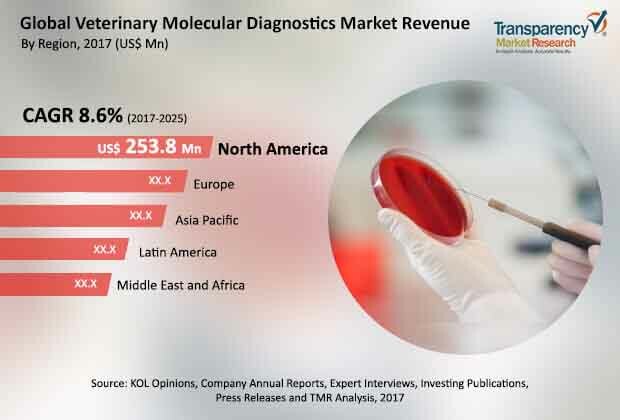 Growth rates of each segment of the global veterinary molecular diagnostics market have been determined after thorough analysis of past trends, demographics, future trends, technological developments, and regulatory requirements. A detailed qualitative analysis of factors responsible for driving and restraining the market and future opportunities has been provided in the market overview section. The report also provides insights into key trends in the veterinary molecular diagnostics market such as shift in distribution channels, changes in consumer behavior, pet humanization and premiumization, and growing mixture of local and multinational players. Key market indicators influencing the global veterinary molecular diagnostics market taken into consideration include cost constraints and regulatory landscape. The report also includes market attractiveness analysis of major segments, which provides thorough analysis of the overall competition scenario in the global veterinary molecular diagnostics market. The report also includes Porter’s five forces analysis of the global veterinary molecular diagnostics market. Market revenue in terms of US$ Mn for the period between 2015 and 2025 and the compounded annual growth rate (CAGR %) from 2017 to 2025 are provided for all segments, considering 2016 as the base year. The year-on-year growth of the global veterinary molecular diagnostics market for each segment is also reflected. Additionally, market-related factors such as increase in medical and diagnostic capabilities for companion animals, greater emphasis on prevention and wellness by veterinarians and pet owners, rise in the number of owners of companion animals across various geographies, and historical year-on-year growth have been taken into consideration while estimating the market size. Based on product, the global veterinary molecular diagnostics market has been segmented into instruments & software, kits & reagents, and services. In terms of technology, the market has been divided into polymerase chain reaction (PCR), microarrays, and DNA sequencing. In terms of animal type, the market has been classified into companion animals and livestock animals. Based on disease indication, the market has been segmented into vector-borne diseases, respiratory pathogens detection, diarrhea pathogens detection, and others. Based on end-user, the market has been segregated into hospitals/clinics and reference laboratories. Geographically, the global veterinary molecular diagnostics market has been segmented into five regions: North America, Europe, Asia Pacific, Latin America, and Middle East & Africa. Each region has been further segmented into major countries/sub-regions. These include the U.S., Canada, the U.K., Germany, France, Italy, Spain, China, Australia, Japan, India, Brazil, GCC, South Africa, and Mexico. The report also profiles major players operating in the veterinary molecular diagnostics market based on various attributes such as company overview, financial overview, SWOT analysis, key business strategies, product portfolio, and recent developments. Thorough market share analysis of major companies operating in the market has also been provided in the report. Key companies profiled in the report are IDEXX Laboratories, Inc., VCA, Inc., Thermo Fisher Scientific, Inc., Novacyt Group, QIAGEN N.V., Biomedica Medizinprodukte GmbH & Co KG, HealthGene Corporation, and Bioneer.